The next Province 34 Workshop, set for Jan 18-20 in Tuscaloosa, is shaping up to be a big one. National President John Mongiovi, Vice President Mark Lichtenberg and Province 14 Gov. Brian Stratton all will attend, as will chapters from Province 24, next door in Mississippi. We also hope to have many alumni there. That's you. Mark your calendars now so you can join us there. 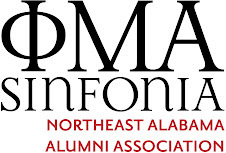 In case you haven't already heard, the fraternity has launched two new programs to recognize its alumni: New Membership Award pins may distributed to brothers to mark their 10th, 25th and 50th anniversaries as Sinfonians. Any brother who has been a member of the fraternity for at least 10 years is eligible for one of these awards. Meanwhile, the farternity has also launched a program to recognize Sinfonians who have served in the military. The Challenge Coin program is made possible by the family of Christopher A. Patterson, Kappa Sigma (Valparaiso) 2010, who was killed in action with the Army early this year in Afghanistan. Both of these programs include new ceremonies for distribution of the award pins and coins to alumni Sinfonians, so plan to RSVP to a province, chapter or NEAL Sinfonia event soon so your brothers can honor you.